Home buyers had many more options to choose from in February as housing market inventory increased 7 percent to 7,442 homes in February 2019 compared to 6,912 in February 2018. 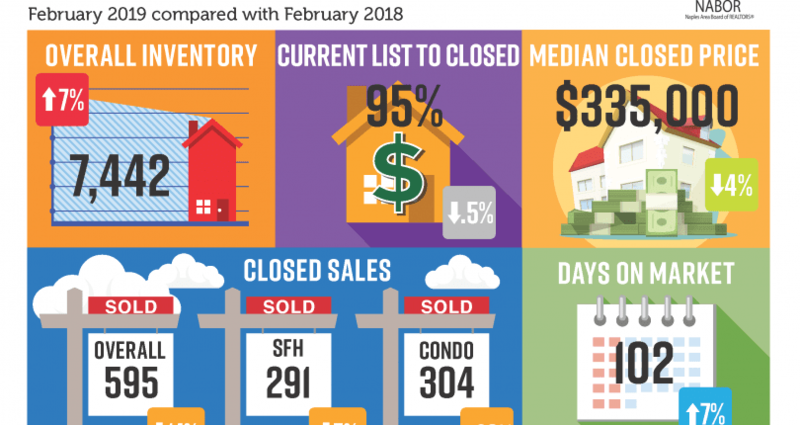 In addition to 1,498 new listings added to the Southwest Florida MLS in February, the February 2019 Market Report released by the Naples Area Board of REALTORS® (NABOR®), which tracks home listings and sales within Collier County (excluding Marco Island), also reflected a 4 percent decrease in the overall median closed price to $335,000 in February 2019 compared to $350,000 in February 2018. While there were 100 fewer closed sales in February 2019 compared to closed sales in February 2018 (a 14 percent decrease), the added inventory has broker analysts like Dominic Pallini, convinced that buyers are not rushing into a sale like many did when inventory levels were much lower; and instead, are meticulously evaluating all their options that include new and existing homes. “The high-end market continues to do very well in our area,” said Mike Hughes, who added that those high-end sales are usually made by very astute buyers and if the economy was bad or on a path to becoming bad, then they wouldn’t be buying as they are currently.